How can I reuse or recycle (quilts and) pillows? | How can I recycle this? How can I reuse or recycle (quilts and) pillows? I have 6-8 used but still serviceable quilts and pillows and no-one seems to want them. The local homeless shelter says they don’t take donations and I’ve contacted several charities who I thought might use them (rather than selling them for recycling) but no-one is interested as they are not ‘good as new’. Even the local PDSA won’t take them for animal bedding. Any suggestions as I’d rather they were put to good use as quilts rather than scrap. I’m surprised that shelters for both humans and animals won’t take them, especially if they’re machine washable. Perhaps offer them on your Freecycle/Freegle group – someone on there might be happier to receive them than charities obeying “no used stuff” policies. On our local Freegle group, people frequently as for “anything for a new home” so they might want them. There also might be people who want them to use for other things – not for their original purpose but not for fabric reclamation/recycling either – for example, using the quilts for making insulating blinds or to make mattress/pillow protectors. Pillows can also be upcycled – they can be “squared-off” to make cushions, used for animal bedding (nesting building dogs love having a selection of pillows to dig around in), made into draught excluders/draft dodgers or bolsters, or the stuffing reclaimed for all sorts of craft projects. Does anyone else have any other suggestions where might take USED quilts and pillows? Or have any more recycling ideas for pillows? I was given a rather garish quilt with cartoon characters on which I recovered with more pleasing fabric and quilted right through it using embroiderery threads with a chain stitch. Effective results, I am sure patchwork enthuisiasts would not be impressed but I have a unique heirloom for not much money (a lot of time only). I then created another one using an old woollen blanket and patchworked with dearly beloved clothing which is also well cherished and much washed. At least here in US, there are tons of animal shelters and zoos that would be interested. The past few weeks it’s been horribly cold – so both of those definitely want to keep the animals warm! You could (in addition to freecyclers) add a note to e.g. university, supermarket notice board or some place where people with less money would see it (esp. students, recent immigrants etc). If the quilts and pillows are clean (and are of material that can easily be cleaned) I’d think most places have people who would need them. Removal companies might use them for protecting furniture in the back of trucks. This is not perhaps the reuse you are seeking but at least it might help someone run their own little moving business. I always like to keep a blanket in the car in case we get caught out onthe road in the cold or someone has to sit on the ground to change a tyre. And that blanket comes in handy for packing things in the car. It needs a piece of fabric or bag to keep it tidy when it is not in use. Children might use them for a cubby house or to pretend camping. If all else fails…your local animal shelter could use them for the animals. They often have nothing for the animals to sleep on but the cement floors…those animals sure would appreciate it! Sadly I have just found my local animal sanctuary is no longer allowed to by cannot dispose of them!! For that reason, they no longer use them! Yes, I donate my old quilts and pillows to our animal shelter and they are so appreciative. I have also seen the difference when a dog gets something that has that fragrance of a home to it rather than the sterile smell of chemicals on something from a store or cleaned to sterilize from previous dog’s usage. The animal seems to immediately take to it over whatever else is in the room as if they know it is just for him/her. I do NOT wish to insult anybody here but merely to give a possible explanation of why charities & shelters may not accept bedding as donations. I speak here from personal experience and would not wish it on anyone. I bought a lovely set of pure cotton bedding from a charity shop, which I washed, I mean, you always wash something when you buy it in a charity shop, don’t you? It was several months later, when I first used it & it took me quite a while to figure out where the bites were coming from. Yep, the bedding was infested with bed bugs! It cost me a small fortune as I had to replace all my bedding, mattress, pillows etc, etc. If a shelter was to get bed bugs, and I believe they are rampant at the moment, not only would it cost them a fortune to get rid of them, they may be open to personal injury claims, likewise charity shops. Unfortunately, I don’t have any suggestions for reusing or recycling them. No I don’t always wash things from charity shops! They steam clean everything before they sell it, so it’s not usually necessary. Having said that, bed bugs are becoming a massive problem both in the US and in the UK at the moment, so maybe it’s time I had a change of policy. Apparently bugs “have been known to survive a year without feeding”, but I’m thinking that if you could find somewhere to store used quilts and pillows, sealed in plastic bags, for longer than that then you could be pretty sure they were not infested. Maybe charities would then take them? I would be careful assuming duvets from charity shops have been washed or even steam cleaned – this is not often the case. Most charity shops will no longer sell duvets and pillows, but might take cushions. Unwanted donations might therefore end up in landfill as textile recycling companies will not take anything wadded either. this is what I was told, I am a Professional Organizer and constantly look for the best solutions in recycling! Make oven mittens out of the quilts. Can make many items of clothing, just cover with another fabric. Quilt can be placed under table cloth so plates do not make much noise when dishes are served, and table is better protected. Several small quilts can be made out of big one and hanged on a wall. Quilt can be rolled and stuffed into round pillowcase to make log pillow. Why not use old quilt it on a picnic or a beach? Also, when installing wooden floors, place old quilts ( if they are the same thickness) under the planks, it will allow for easier walking afterwords. I’ve had wonderful success turning old quilts into a new one. Choose a simple placement design for squares. Fussy cut each one, sew together with new but washed fabrics as sashing and you have a new quilt that still shows the original stitching on both sides as well as the vintage patina. I hope to find more old quilts to revitalize! Here’s a couple of things I’ve done: 1. Cut old blankets into longish,door- or window-width strips, rolled them up tight, tied or wrapped the roll tight with string (or the old electric cords, if it’s an electric blanket! ), simple-sewed a fabric tube to be a cover (flannel works well), leave one end unseen but fastened so you can take the cover off and wash, and there you’ve got a draft-stopper for a door or window. 2. Make a duvet-style cover by buying on-sale queen or king flannel sheet or duvet sets. Measure (doesn’t have to be perfect, just not TOO much bigger than the quilt you’re covering), turn the material right sides together, sew up three and 1/2 sides. If you get a duvet set, it’s super-simple, because they’ll have a button or some other opening on one end and you won’t need to make your own closure. 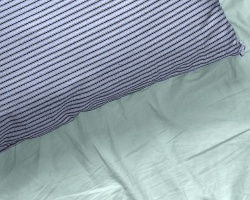 If it’s a sheet set, some closure is needed–buttons for the ambitious? a few large snaps? velcro? When it’s dirty, you can then remove the cover, wash it, and put the old quilt back inside. Hint: Make the opening big enough so that you can get the old quilt in! If the opening is only 1/2 of the side, fold the old quilt and put it in that way, then unfold once it’s in. I also used the rest of a flannel sheet set for covers for the draft-stoppers, and a set of kitchen curtains (white muslin backing, nice muted plaid pattern). Those heavy plastic zippered packages the sheets come in can also be used as nice storage. Sorry this is so long! I had several quilts that were very worn. I created what I call Vintage to Modern: a tattered and torn heirloom quilt was re-invented into a modern design. I cut out the good parts pieced them together into a whole new modern quilt. I have been making padded message boards using the wadding from inside duvets. I can only fit single ones in my washing machine which I then wash on a hot cycle.after it is thoroughly dry cut away the outside fabric, use this for cleaning rags, cut into the required shape and use as needed. I recently took my unwanted duvets to my local greyhound rescue – they were very grateful. They will not accept feather or down duvets though. They are based in Hersham in Surrey (KT postcode). i make them cushions for my pets and living room. the rest was sent to recycler. My friend gave me a duvet which she didn’t want, it was new. I have enough bedding so I cut it into nine squares and made pet beds out of it. I cut up a used duvet cover to make covers for them. They are washable and fit into a machine easily. My cats and dog love them. Turn them into entertainment, heat and light on bonfire night.?? I’ve often used old quilts etc for insulation. for example, they can be made into sausage style door stops. I also use them to cover the inside of the up-and-over garage door (which is a big area). Although not quite the same you could use them to pack out any spacing between ‘walls’ which is what I did once for a small Tree Hut. The only thing with using Duvets is that the material can get rather wet/damp so best not for long-term use. Alternatively, you can re-use expanded Polystyrene as insulation blocks for cavity walls in sheds etc. Works a treat. Turn them into sleeping bags for the homeless. My Brother’s Keeper is the organization that started this movement; they have clear instructions on their site, if you need them.